Steven (Chicagoland, United States) on 21 October 2011 in Architecture and Portfolio. The Frederick C. Robie House is a U.S. National Historic Landmark in the Chicago, Illinois neighborhood of Hyde Park at 5757 S. Woodlawn Avenue on the South Side. It was designed and built between 1908 and 1910 by architect Frank Lloyd Wright and is renowned as the greatest example of his Prairie style, the first architectural style that was uniquely American. It was designated a National Historic Landmark on November 27, 1963 and was on the very first National Register of Historic Places list of October 15, 1966. 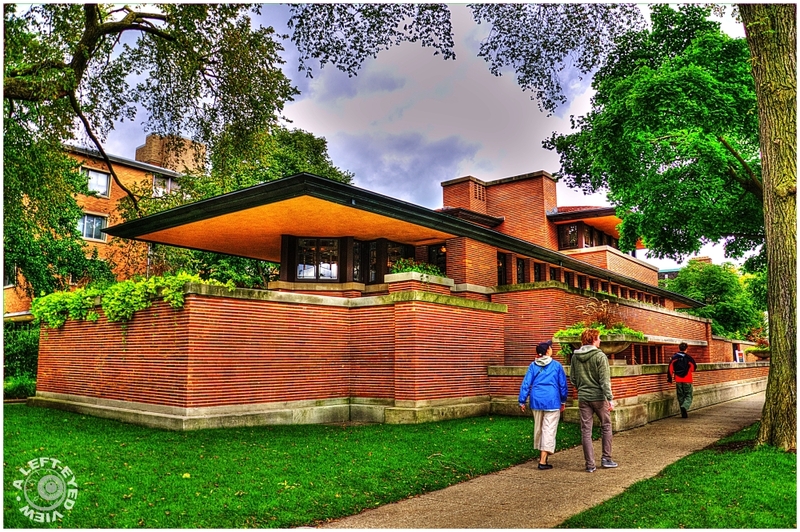 The projecting cantilevered roof eaves, continuous bands of art-glass windows, and the use of Roman brick emphasize the horizontal, which had rich associations for Wright. The horizontal line reminded him of the American prairie and was a line of repose and shelter, appropriate for a house. The exterior walls are double-wythe construction of a Chicago common brick core with a red-orange iron-spotted Roman brick veneer. To further emphasize the horizontal of the bricks, the horizontal joints were filled with a cream-colored mortar and the small vertical joints were filled with brick-colored mortar. From a distance, this complex and expensive tuckpointing creates an impression of continuous lines of horizontal color and minimizes the appearance of individual bricks. The design of the art glass windows is an abstract pattern of colored and clear glass using Wright's favorite 30 and 60-degree angles. Wright used similar designs in tapestries inside the house and for gates surrounding the outdoor spaces and enclosing the garage courtyard. The planter urns, copings, lintels, sills and other exterior trimwork are of Bedford limestone. Photo captured September 30, 2011.
wow, this is perfect HDR work! the colours and details are outstanding. Beautiful shot.. love the details and the patterns.. amazing colours. Good angle of approach to accentuate the horizontal style, great job with Photomatix here. Yes, this design is pure genius - and a perfect angle to create this marvelous shot. A marvelous capture. The colours and detail is superb. Beautifuly captured and presented. I love these modern architecture, so different from the one you can see in Paris (for ex). Great work on tone mapping and contrast range ! Wright's genius was evident the moment I laid eyes upon this. Excellent processing and image quality. A beautiful piece of architecture that you've shown us so well here Steven! Your processing really brings out the details. great architecture in a very nicely and effectively processed photo! this being a national historic landmark, i take it it is no longer inhabited but used as a kind of museum? which is good on the one hand because the building will "survive", but sad on the other because it is"alienated" from its original use! but better this than the alternative ... tear it down and replace it with something "new"! This is beautiful! Great angle and wonderful color! A class A HDR! Perfectly processed. Two thumbs up. Nice hdr! Great angle for this image! An exquisite photo of this magnificent house. Bravo! Fantastic HDR, everything is perfect. stretching out the building as far as the eye can see. Superb shot of this elegant building, a fitting tribute to the genius of FL Wright! fantastic and impressive processing my dear! I love your post about buildings and architecture. Frank Lloyd is an ingenious architect, this is a very special, beautiful and impressive building, I would like to see more of his works! !